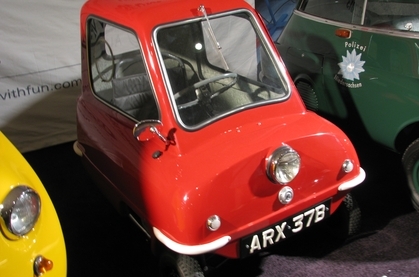 In USA Today yesterday, I read an article on the smallest production car ever made, a 1962 Peel P50. The Peel was an attempt to evaluate the absolute minimum dimensions necessary to build a car. An interesting feature of the car was that it had no reverse gear. There was a handle on the rear of the car. When you wanted to change direction, you simply picked up the rear of the car and turned it around. With one seat, the car is far from practical for almost everyone. But, it did get me to thinking bout the choices of features that people select when they choose virtually any product. One design rule that has stuck with me through the years is the "20/80" rule. The rule states that we use only 20 percent of all features on our products 80 percent of the time. That iPod, or washing machine - how often do we deviate from a few preferred settings? Just another reminder to designers to keep it simple. One of the projects that I was requested to initiate at GeoSystems was to minimize excessive noise and vibration of their heat pump systems. One of the points that most heat pump manufacturers don't like to discuss is noise and vibration in the winter months. While the technology is amazing, it does require the use of a scroll compressor to be used inside the home. This is the same type of compressor that is used in central air conditioners. One difference. The compressor is now inside the home and typically runs about 80 % of the time. Many customers had been complaining about this low frequency "hum" disrupting their home environments. Noise is an abstract problem to pin down with most consumers. One person's noise may not bother another person in the least. Study revealed that the compressor was a major contributor to the ambient noise and vibration issue. The compressor had two known noise sources. The first was the movement of compressed gas charges through the internal HVAC circuit. This was addressed with the use of less radical pipe bends. The second noise source was insufficient damping of the compressor mounting feet. Reviewing the foot design, I noted that the design had been used with limited success for over 40 years. The feet also used neoprene as the vibration absorbing material . Neoprene, you know the same material in wet suits and was invented in the 1920's. It's ability to damp vibration is extremely limited. Inspiration for an alternate damping material came from athletic shoes. I had been using an insole with a material called Sorbothane for many years with great success in preventing injury. Sorbothane is in a class of materials know as viscoelastic polymers. These materials convert vibration into mild heat. If it works in running shoes, why not Heat Pumps? Several weeks and prototypes later, I was able to damp vibration from the compressor by a range of between 64 and 92 percent. Now, if I could only beat a 12 minute mile . . . . . .
An exciting trend in green design is the realization that a great deal of free solar energy continually falls on the outside of buildings. In many instances, this energy is reflected or absorbed as heat. Building science engineers and architects have been studying how to capture this energy in manners that blend more attractively – and efficiently – into the outer surface of the building. First, came solar collectors. They are starting to show up everywhere we look. Those blue and gray rectangular panels we often see situated on top of commercial and residential buildings. Many companies and individuals are proud of their solar collectors and show them off on the outside of their buildings. These companies and people are to be commended for their forward looking and green attitudes. But, designers and engineers have also realized that there is also a group that want to be green with a more stylish emphasis. Enter Building Integrated Photovoltaics or BIPV for short. BIPV is based on the philosophy of creating methods to capture solar energy that are more integrated into the building design. These methods can range from films that can be placed over glass to collector panels that blend seamlessly into the roof line. Recycling isn't just good for the environment, it's also critical in design. As design engineers we are continually trained to reuse parts in new designs. For fasteners and hardware this is relatively easy in most companies. For fabricated parts, it's another matter. Most designers will make a half hearted effort to locate existing parts. You know the drill. Ask your coworkers if they have ever seen a similar part before. Open a few files that look promising. No Luck? No time to waste. Create a new part. And the inventory of parts keeps growing. What if there were a search engine for part shapes? Kenneth Wong of esktop Engineering has an excellent article on CADseek from iSeek that discusses shape based search. My wife and I love redbox. It provides a nice, convenient, way to pick up current movies. As a mechanical engineer, I'm fascinated by the rental machine from the robotic delivery system to the wireless inventory management. A couple of design features could use additional thought. The first is the display. Great indoors but outside - almost unreadable. redbox has added a sunshade but I don't know if it's to protect the display from the sun or to be used as one of those old time photographer hoods. My wife and I use it as a hood. Second item concerns returns. Ever get stuck behind someone who is browsing when all that you want to do is return your disc? Why not let the side slot multitask and accept your return while the other person browses? Human Factors - Who Knew? Everybody buys spray nozzles for their garden hose. It seems like I buy a new one every year either by the item breaking or a new nozzle having some cool new feature that I think I need. Many spray nozzles are designed with the spay button triggered by your index finger. Nestled on the interior of the grip, the trigger is out of the way of accidental actuation when the hose is inevitably drug along the ground. I purchased a new nozzle from Menards that had a thumb actuated lever on the end of the nozzle. In the store, it appeared like a great design - smooth, easy to move. When I got it home, the design flaw became obvious. While winding the hose up for storage, the thumb lever contacted the ground and turned the sprayer on. After wrestling a now writhing splashing hose and getting a faceful of water, I thought " Hey. It's an accident. No way it will happen again." Until it did. The next day. Getting a wet face, and clothes occurred daily until I threw out the new nozzle and went back to my old reliable. The fundamental issue with the design is whether anyone actually tested the design in real world conditions. With rapid prototyping, functional models could have been built AND tested. Were they? Working with local designer of residential conservatories to study airflow and improve overall energy performance.